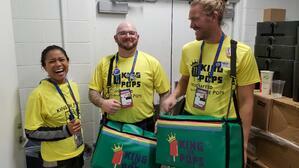 The Opposite of Undercover Boss: How leading from the front is a part of King of Pops culture. I spent last night at the Super Bowl. I'm not a fan of the Rams or Patriots ... still, I got there with my fiance Nancy and brother (& co-founder) Nick almost eight hours before kickoff. We retrieved our credentials and were warmly ushered into the stadium by throngs of amazing volunteers. I've been in Mercedes Benz Stadium dozens of times, but it was clear that this event was on a new level. As we went up the escalator, the magnitude of it all washed over us. This is the most watched event in the U.S. and one of the most important sports events in the world. 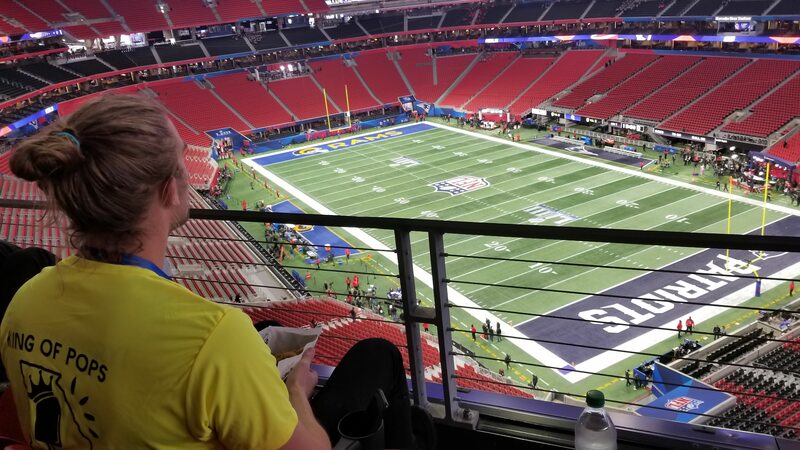 Check it off the bucket list, we were at Super Bowl LIII. Ok, so we didn't have $5,000 tickets. Instead, we were headed to a supply closet with a handful of chest freezers and a dozen amazing King of Pops employees. We had to be in by 11am. Kickoff would be at 6:30pm - 7.5 hours later. It gave us plenty of time to catch up, grab a bite to eat and even a quick nap. Eventually, the gates opened and fans began to stream in. Our informal huddles were broken up as ushers made it clear that it was time to get to work. It's meant to be taken literally. It's a constant reminder to find some time to roll up your sleeves and put in a physical effort. Usually it doesn't take much to work up a sweat in the middle of the summer on a cart. And I can confirm it doesn't take long walking up the stands and down the stands with a cooler of pops either. Core Value or not, I often go long stretches forgetting the importance of this very simple idea. Getting Sweaty is important for so many reasons. We see people differently when we work next to them. I regularly get caught up in the business development and forget about the business we are in. It isn't fair to be frustrated with a problem until you've put yourself right in the middle of it. And it's a mistake to deem anything a success until you've felt the impact first hand. I've rarely pulled this off. More times than not, I've failed to be on the front lines when I needed to be. I've seen it more than enough times to know that when things are not going as planned, leaders get a lot more leeway from their team if they're there in the middle of it. The times when you want to be locked away in your office alone, is probably when you should be there the least. And when things are going well, a beloved leader can amplify success exponentially. Most importantly, it's simply more fun to win with others. Until yesterday, there was only one Super Bowl that I can even really remember (and that's because my beloved Falcons blew it), but I know I'll never forget this one. © 2018 King of Pops. All Rights Reserved.